Each year thousands of children are rushed to hospital emergency rooms with eye injuries. Many of the injuries are the result of participating in sports related activities. Sadly each year some of these injuries results in permanent eye damage or blindness. The National Eye Institute reports that ninety percent of sports related eye injuries could have been prevented if the children were wearing protective goggles. Protective goggles are not just for children that wear corrective lenses. Protective eyewear is available in both prescription and non prescription styles. In the United States all safety goggles and glasses must pass a number of safety tests and conform to strict criteria regarding safety standards. The industry standards are mandated and supervised by the American National Standard Institute, known as the ANSI. Whether you are purchasing safety goggles or glasses for a child or an adult, it is important to make sure that they are approved by the ANSI. 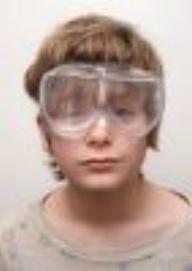 Safety goggles for children are manufactured in a wide variety of types and styles. When choosing safety goggles for your child, there are several important aspects to consider. Most safety goggles have clear polycarbonate lenses providing protection from impact. Since they are impact resistant, polycarbonate lenses do not shatter reducing the risk of eye injury from shards of broken glass or plastic if an impact does occur. The lenses are generally coated with a scratch resistant coating and provide UV protection. Polycarbonate lenses are the industry standard for safety goggles and glasses. If safety goggles do not fit a child comfortably, they may not wear them. Make sure that the goggles have padding where it is needed. Many safety goggles have soft padding around the bridge of the nose, the temporal regions and the sides providing a protective and comfortable fit. Safety goggles are also available with shock absorbing padding and frame materials that are hypoallergenic. While many online retailers offer both prescription and nonprescription safety goggles for children, there are many others that only sell nonprescription goggles. Some of the nonprescription styles of safety goggles are made to fit over a child's prescription eyeglasses. Protect your youngster's eyesight by making sure they wear child's safety goggles when participating in sports and other activities that may cause eye damage.